He walked for three days to fulfill a promise he gave a year ago. From over there beyond the mountain, from the summer pasture. By way of an old footpath, which nobody except him remembers anymore. Whitefoot came with him – Ak-Khol, his dog with white front legs. 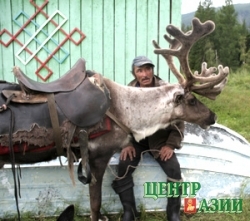 And two riding reindeer, Blackie and Zorka.